In late March of this year, we started a new residence on an infill lot in Benicia that we plan to get certified as LEED Gold. Walls and roof will be Insulated Concrete Forms (ICF) or Structural Insulated Panels (SIP). The architect is Tom Wilson, LEED AP of Benicia. 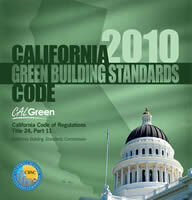 The California 2010 Green Building Standards took effect on January 1 of this year. We will meet all residential mandatory requirements and most of the residential voluntary measures of this code. The Green Building Certification Institute (GBCI), a third-party organization that provides independent oversight of professional credentialing and project certification programs related to gene building will oversee LEED certification of this project. Location and Linkages - This infill project will use existing infrastructure, require no new roads, is close to transportation routes, and is easily walkable to community resources. Sustainable site - Landscaping will preclude invasive plants, limit conventional turf, will consist of native and drought tolerant plants, and will have reduced irrigation requirements. We will reduce local heat island effects by installing light-colored, high-albedo materials or vegetation. Site features will be designed to minimize erosion and runoff from the home site. We will use permeable paving, permanent erosion controls and managed runoff from the roof and alley to achieve this. Home features are designed to minimize the need for poisons for control of insects, rodents, and other pests. Water efficiency - The project will include a rainwater harvesting system, graywater reuse, high efficiency irrigation, reduced overall irrigation demands, and high-efficiency fixtures and fittings. Energy and atmosphere - We will design and install insulation to minimize heat transfer and thermal bridging, insulation, minimize energy consumption caused by uncontrolled air leakage into and out of conditioned spaces, maximize the energy performance of the windows, use 94% efficient flash water heaters and hydronic heat for an efficient heating system, use Energy Star advanced lighting, and use high efficiency appliances. Electrical and hot water requirements will be supplemented with combined photo voltaic and thermal panels. Materials and resources - We will optimize the use of framing materials. Lower walls will be Insulated Concrete Forms (ICF). ICF typically has a waste factor of about 1%. Remaining house walls and roof will be Structural Insulated Panels (SIP). These panels will be built off site and also have very little waste. Floor joist packages will have framing members cut to length. Flooring will be FSC certified. Concrete will be a 50% fly ash mix, siding and aggregates will be local content, and bead board and redwood planks from the old house will be used as interior finishes in the new house. Indoor environmental quality - Some can argue that it is not only desirable, but also a fundamental human right to live and work in spaces with healthy indoor environments. Buildings enhance peoples lives when they permit ample air circulation, maintain clean air and comfortable temperatures, and allow individuals to have a sense of control over their own indoor experience. We will ensure proper combustion venting, moisture control, enhanced outdoor air ventilation with third party testing, enhanced local exhaust with third party performance testing, radiant heat with individual room controls, air filtering, indoor contaminant control, and radon protection.